The first curry house in England opened over 200 years ago and thus began the great British love affair with Indian food. 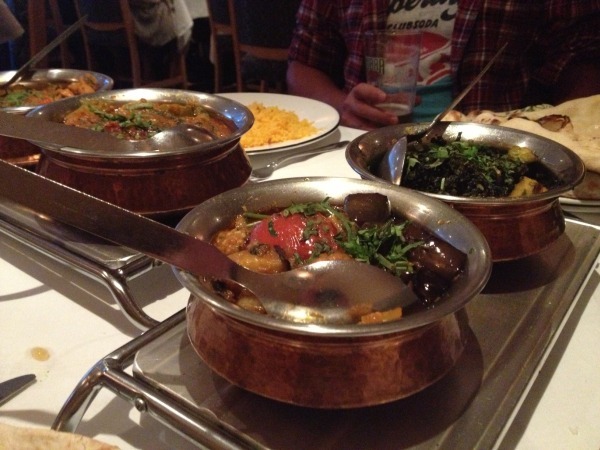 From Queen Victoria to those of us craving a post pub meal on a Friday night, we can’t get enough of the stuff which is why I find it truly astonishing that there are so many bad curry houses about. You know – the ones that serve tiny cubes of meat lost in a luminous sauce topped with a scalding pool of fluorescent oil. But here in Bristol, we’re blessed enough to have the pick of some very good Indian restaurants, the Bengal Raj being one of them. Opened in 1998, it was the second of two Indian restaurants opened by four brothers. The first one is the acclaimed and multi-awarded Brunel Raj in Clifton Village. The Bengal Raj is situated within a few doors of the excellent Stoke Bishop Fish Bar (its sister shop also residing in Clifton Village), and its tranquil location belies the cuisine inside. I visited the Bengal Raj with my other half, mother and brother at 7.30 on a Friday evening and the first thing I noticed that the inside of the restaurant was a bit beige and entirely different to the more quirky Brunel Raj but it was packed out – surely a good sign! Although busy we weren’t kept waiting at all and our waiter was quick to collect our drink and food orders. We opted for poppadoms to start with and they came with a fully laden tray of delicious looking dips and pickles – cooling minted yoghurt, fragrant mango chutney, sweetened coconut, sour lime pickle and a very finely diced onion salad. 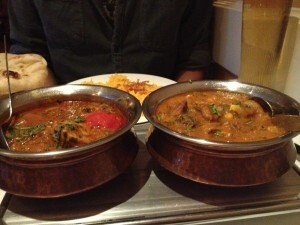 For our main dishes we ordered a lamb dhansak, chicken tikka rezala, chicken kerala and a chicken achari. My mother ordered the achari but as she rarely finds Indian curries hot enough for her we spoke with the waiter and he offered to take it to the level of a madras but offered more chillies should she need them. We also ordered sides of sag paneer (spinach with Indian cheese) and brinjal bhaji (aubergine) along with a variety of naan breads and a tandoori roti. 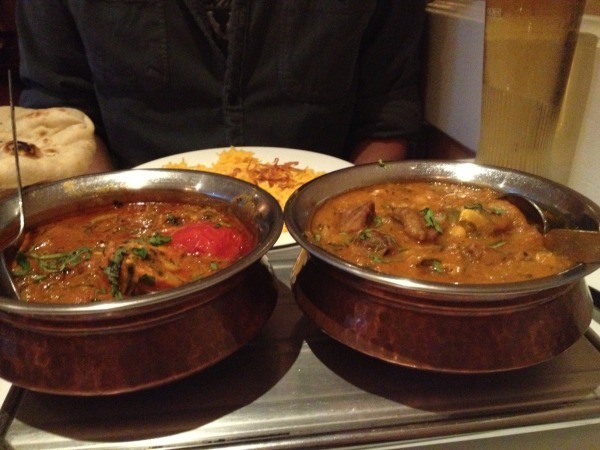 Our food was brought to us steaming hot in beautiful hammered curry bowls which our waiter told us were made to order especially for them by a manufacturer in London – they were deceptively large as they were much deeper than ordinary curry bowls which meant the portions were very generous. All of the dishes smelt wonderful and were extremely appetizing in appearance – no day-glo sauce and certainly no pools of oil floating on the top. The dhansak was hot, sour and sweet all at the same time with a great depth of flavour, and made the perfect pairing with my peshwari naan which was light and fluffy with sesame seeds scattered over the top providing a pleasing texture. The chunks of lamb were tender and meltingly soft, I was able to cut through them with just my spoon. The chicken dishes were packed full of large pieces of moist chicken breast but most importantly of all – they all tasted completely different. I’ve been to so many curry houses where the dishes all look the same and barring different ‘heat levels’, all of them taste the same. The rezala was thick and flavoursome with tomato and onion and the kerala was highly spiced with fresh coriander, fennel, cloves and red chillies but could definitely have been hotter. The achari came and it was delicious – sharper than you would expect as it is cooked with both lemon and lime juices but not in an overly acidic way, just enough to enhance the taste of the other spices and as requested the chef had slipped a few fresh green chillies into it to try and bring up the heat level. Although still not hot enough for my Mum, it was great that they had tried to cater for her and she was very pleased with it – no easy feat, I can assure you! I’m a massive fan of spinach in general and saag paneer is one of my favourite side dishes – again we were given a generous portion and the iron-heavy spinach was cooked with fragrant garlic and lovely chunks of paneer cheese with the texture of firm tofu. The brinjal bhaji was also delicious – due to it being an aubergine dish, it was understandably quite oily but that was to be expected. Cooked with tomatoes and onions, the smokey aubergine’s white flesh was almost creamy and was delicately flavoured with cumin. The only thing to question was that the tandoori roti was quite soft like a chapatti rather than being crispy on the outside but that might just be down to a regional variation. The dishes were so huge that we had to take a lot of it home with us and the very friendly waiters were more than happy to bag everything up for us. It was a thoroughly enjoyable meal and we will definitely be back to tackle other things on the menu, especially the many cast iron sizzling dishes that we were eyeballing at another table! If you haven’t found your ‘HG’ go-to curry house yet, I urge you to try the Bengal Raj – and wear your stretchiest trousers!